by Henrik Ibsen, adapted and directed by Adria C. Le Boeuf. 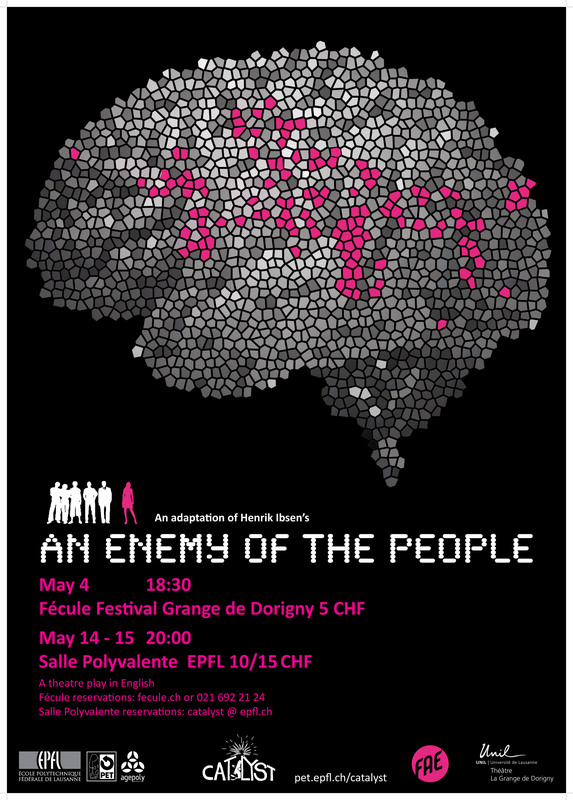 Performed at the Fécule Festival at La Grange de Dorigny May 4th, 2014 and at the EPFL Salle Polyvalente May 14-15th, 2014. The new startup incubator BioInnovate is ready for their first major success story. The Emote, a novel brain-machine interface to treat depression and other mental illnesses, is just finishing clinical trials when the outspoken and charismatic Dr. Elise Stockmann, staff scientist, reveals what she thinks may be very serious behavioural side-effects. At first hailed as excellent news, considering the product hasn’t yet gone to market, soon everyone in the small entrepreneurial community has turned on her, trying to keep her quiet for the good of the company–and for the good of everyone’s wallet. This adaptation of Ibsen’s classic play about the failings of the majority is here transposed into our time and set in our hypothetical backyard. If we were stockholders, would we want Dr. Stockmann kept quiet? Blue Butterfly: revived for a second round!